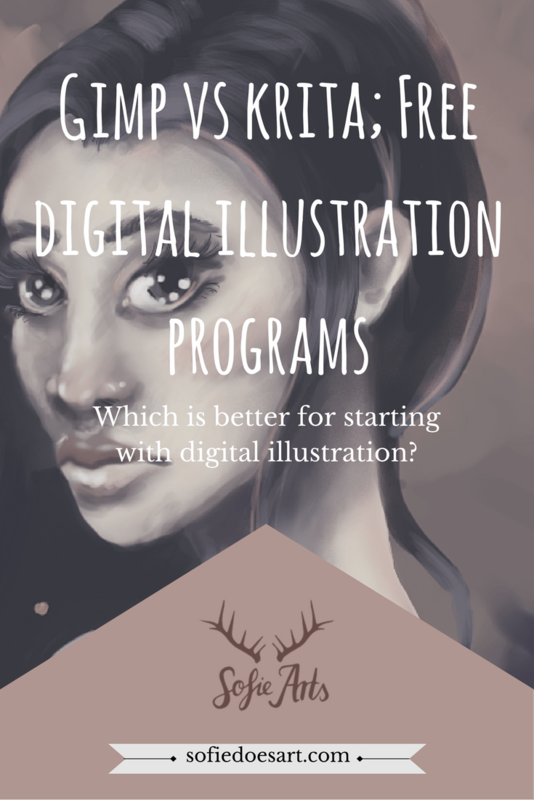 If you want to get started in digital illustration or art but you do not have the budget to afford photoshop there are a lot of great programs out there you can use for free. Two of them are Krita and Gimp. Both are free and I have used both a lot. I thought I would share my experience with both of them for any new artist out there who don’t know which of the two to choose. I have tried a lot of digital programs for illustration and Gimp & Krita are definitely there with the best free software. I prefer the interface of Krita over Gimp. I think it looks more professional and I like how customizable it is. 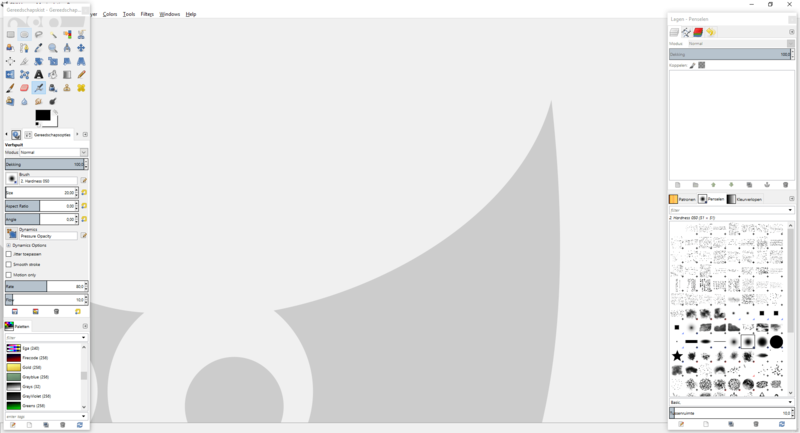 However, Gimp is slightly apparently simpler to understand. 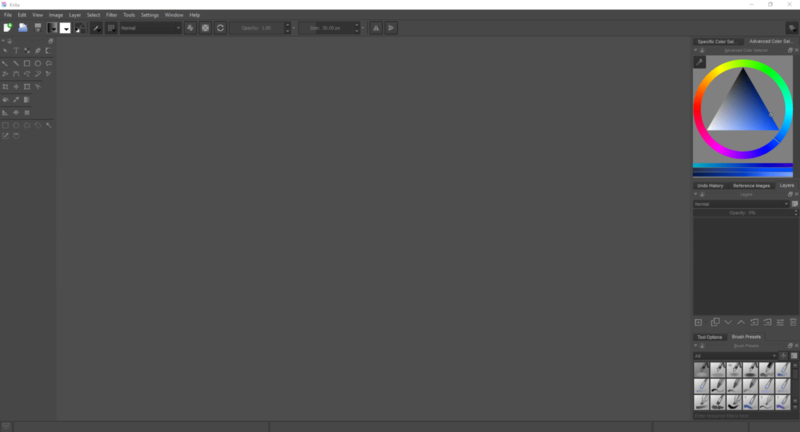 When you open Krita there are a lot of buttons at once When you are a beginner and not planning on reading any tutorial that might be better for you. Also, since Krita is newer there are fewer tutorials for the program. But if you have worked with illustration/photo editing programs before it is not that hard to figure out on your own. Both work with docks for different functions that you can move around. This makes them both customizable! Both of the programs come with preset brushes. However, Krita does not only have more of them, they also come with effects and smooth finishes that GIMP never had. Gimp does, however, have a green pepper brush. Finding new brushes for Gimp is also a lot easier. But you will have to make sure you can use those for commercial use. One of the biggest advantages of Gimp is that the brush strokes load a little bit faster in general. But when I work very big I still get lagging. Krita does lag a little bit more. But I think this is mostly because of the great quality of the brushes that are already pre-installed. I think Krita really tops in this one. Not only are the effects a lot smoother I also had a lot less trouble finding them. For example, when you use the color balance in Krita it makes a smoother appearance than when you use gimp. I have used GIMP for years and I simply could not figure out where some of its features were if it was there at all. I think that for Krita to have them both better and easier findable is a huge advantage. In general, Krita is meant as an actual painting program where GIMP is not meant as only a painting program but also for photo-editing. This means that GIMP has more options, but Krita has them better suited for painting digitally. Also, when you open Krita you have a lot more buttons and options from the start but like I said it is also very customizable. Gimp does also have a lot of docks and customizable setup. And like I said before, Gimp lets you download extra brushes and there are a lot of those around to try! Even though Gimp has been around longer the development of Krita is going so much faster. My most important point here is, is that Krita is actively seeking the advice of graphic designers and artist as to what should be improved and added. I think that is a huge advantage as the most artist have a pretty clear view of what could be improved for the software that they use. My most important point here is, is that Krita is actively seeking the advice of graphic designers and artist. Asking them what should be improved and added is great. I think that is a huge advantage. Most artists have a pretty clear view of what could be improved for the software that they use. Actually asking the people who are going to use it should not be so revolutionary but it is and it does give the most wonderful results. Of course, Gimp was never just meant as a digital illustration tool. Therefore their audience is much bigger and they have more groups to listen to! Overall I will whole heartily say that both programs are great. But if you want to create digital illustration and paint Krita is the way to go. I personally think that that program is not only the better of the two it has also made me a better artist. Since it is meant for digital illustration it is easier to use for such. Let me know which programs you like to use in the comments! The last details of an artwork!